Mouldy Sioud (photo) from the Department of Immunology at the Instiute for Cancer Research is senior author on an article recently published in Oncotarget (journal impact factor 6.36), entitled "Cancer cell-binding peptide fused Fc domain activates immune effector cells and blocks tumor growth". Most tumors escape traditional T-cell killing via alteration of their antigen processing machinery and/or downregulation of MHC class I expression, rendering the antigens/neoantigens undetectable by the immune system. Thus, the way forward for immunotherapy lies in our ability to design new targeted therapies that not only recruit, but also activate innate immune effector cells (e.g. macrophages, NK cells) to kill tumor cells independent of their mutational load and MHC-expression status. By fusing cancer-cell binding peptides selected from peptide libraries to the Fc domain of human IgG1, we have married the targeting specificities of the peptides with the effector function of antibodies. One the engineered peptide-Fc fusions activated innate immune cells and inhibited tumor growth. 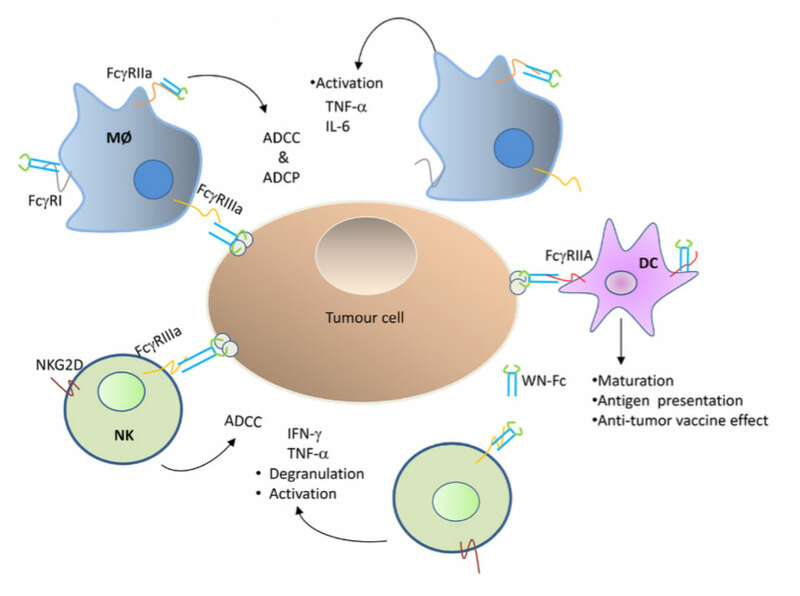 The study reports on the first peptide-Fc fusion with dual functions, namely to be both activator of innate immune cells and killer of cancer cells (see illustration, Fig. 10 article). In addition, to the described peptide Fc fusions, we have developed several therapeutic minibodies that meet cancer patient demands-off-the-shelf use (patent application via Inven 2). Mobergslien A, Peng Q, Vasovic V and Sioud M.